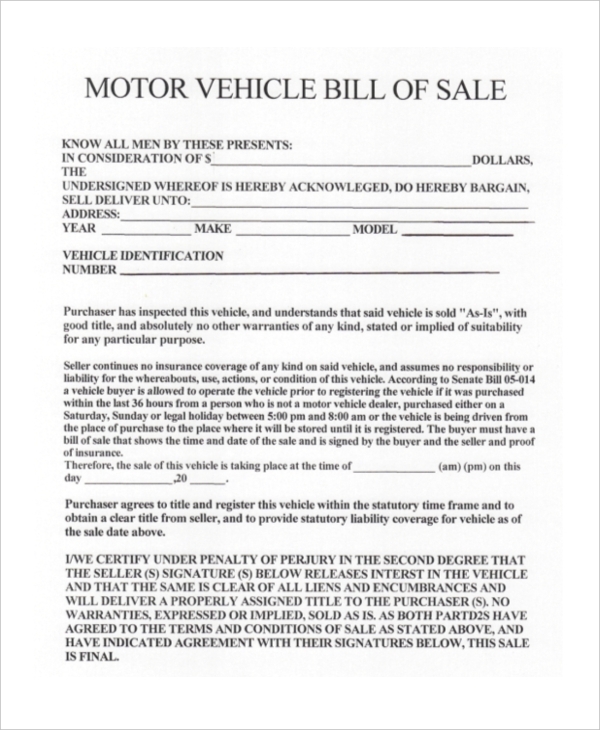 A bill of sale works as a necessary document for all the required information about the sale of a particular vehicle, its buyer, and the seller. Whether you are a buyer or a seller, a bill of sale vehicle is crucial to be maintained in order to avoid disputes and obligations in long run. 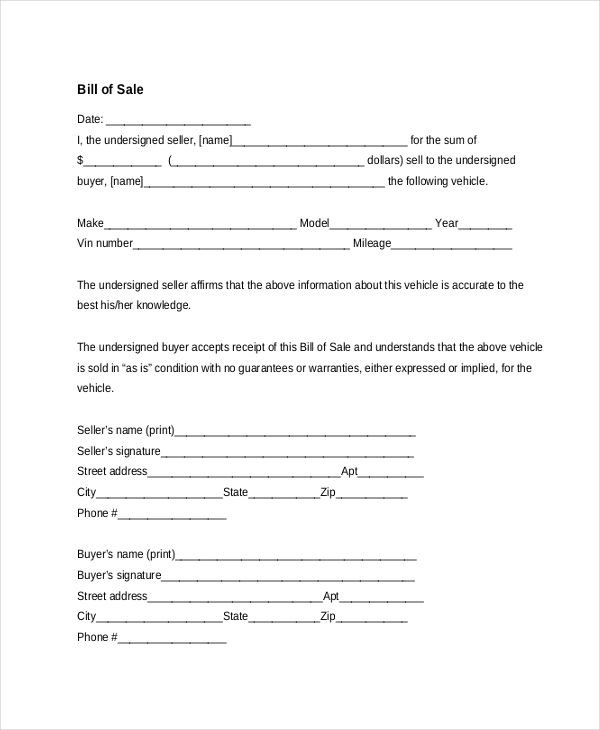 If you want a bill of sale document for recording your sale or purchase of vehicle then check out below listed Bill of Sale Forms and let the suitable one help you create a perfect bill of sale. Are you selling your vehicle to someone? Create a perfect bill of sale of the vehicle with this sample format that lets you transfer the ownership and associated rights of the vehicle to the buyer. You can also get this form printed easily. Here is the perfect used vehicle bill of sale sample available online for download that acts as a solid record of vehicle sale or purchase transaction between the seller and the buyer. You may also see Auto Bill of Sale Forms. 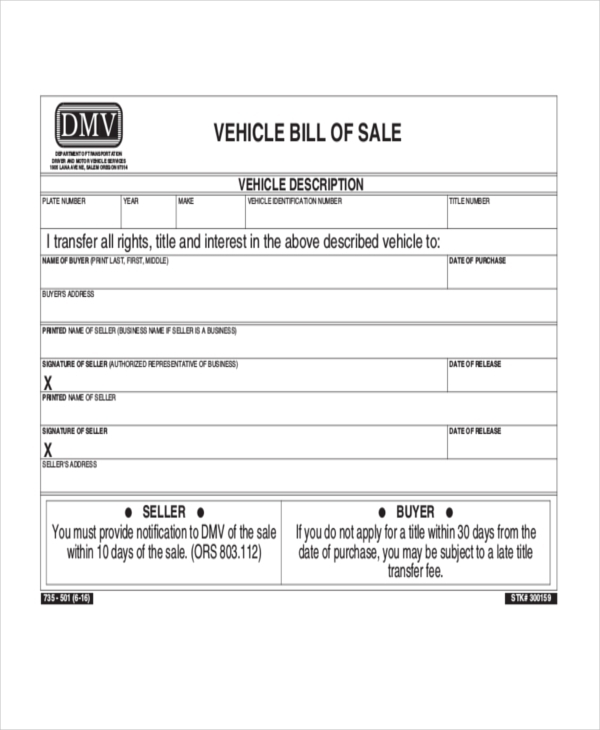 Try this blank bill of sale for the vehicle. By using this sample you just need to fill the necessary sales details including vehicle information, buyer’s and seller’s name, address, contact number etc. Here is another private vehicle bill of sale sample that can help you create a detailed bill of sale of the vehicle. It consists of blank columns for including details about the buyer, seller, and the vehicle. You can also see Bill of Sale in PDF. 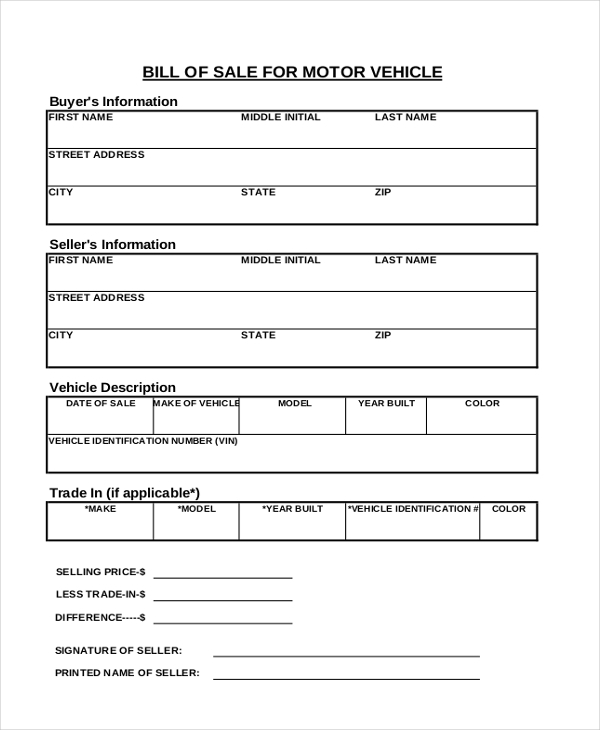 Create a trusted and thorough bill of sale for the sale of DMV vehicle using this sample bill of sale available online for instant download. The clauses of this sample can be edited as per particular recording requirements. 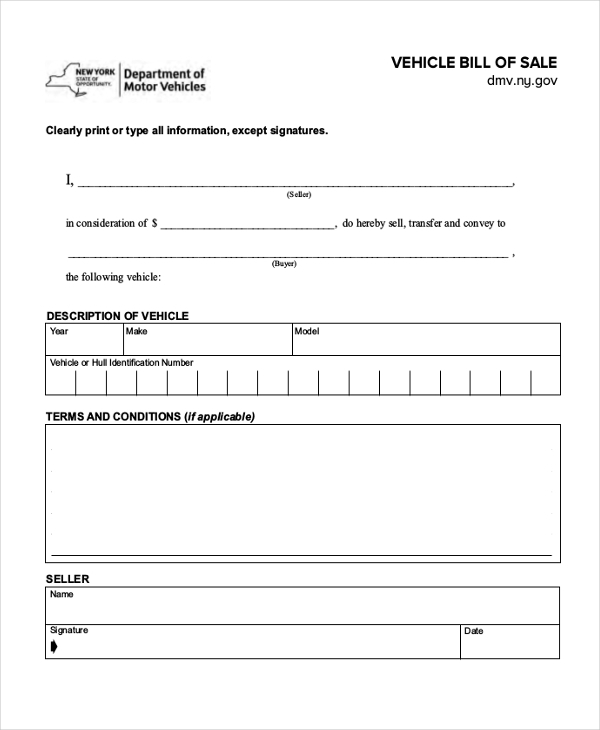 You may also see Sample DMV Bill of Sale Forms. 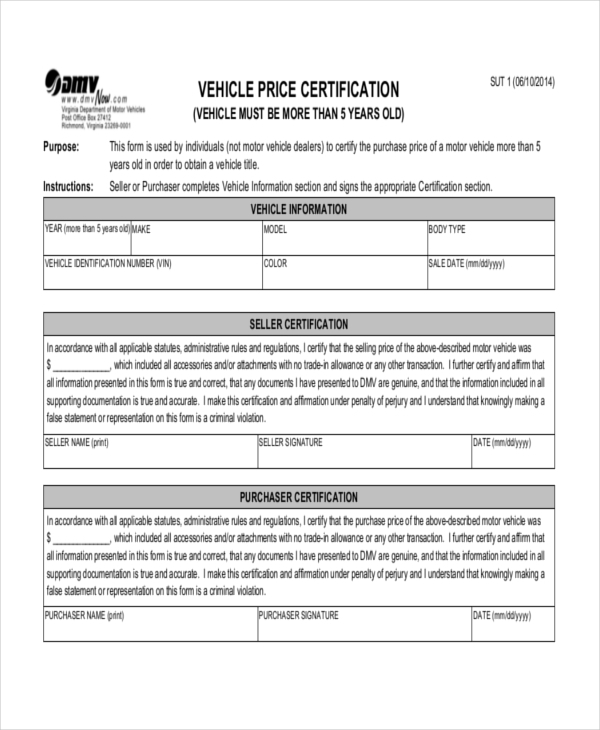 Check out this auto vehicle bill of sale template and get downloaded to create a bill for the sale of the auto vehicle. It will help you create a solid record of the transaction. Get this standard vehicle bill of sale form downloaded online and prepare a professional bill as a proof of vehicle sale transaction between two parties. This can be customized to suit particular documenting needs. This MV24 bill of sale form is ideal for documenting or recording transaction between two parties for the sale of the vehicle. 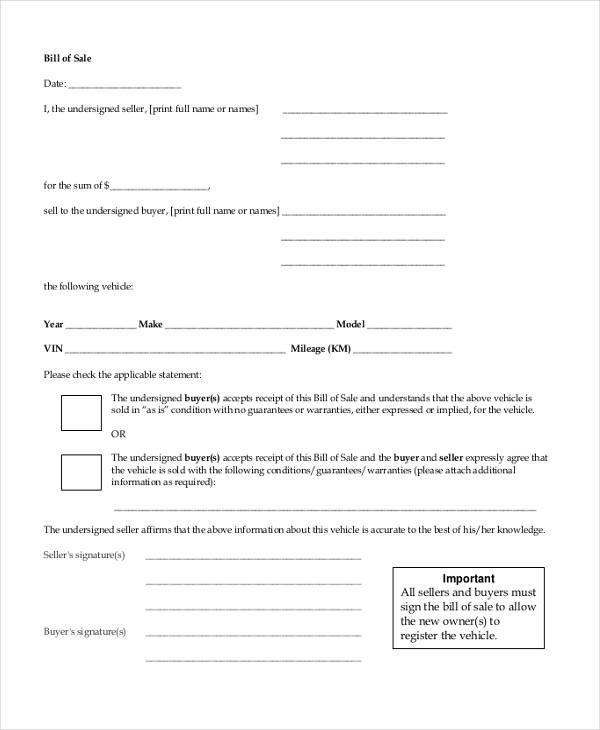 This form discloses complete details about the vehicle along with necessary information about the seller and the buyer. You can also see Free Bill of Sale. Why do You Need a Vehicle Bill of Sale Form? A bill of sale vehicle is important to be maintained by both buyer and the seller. If you are a buyer then a bill of sale will not only serve you as a sale record but the various vehicle details provided within that like purchase rate, vehicle identification number, and odometer reading will make the registration process much seamless and easier. 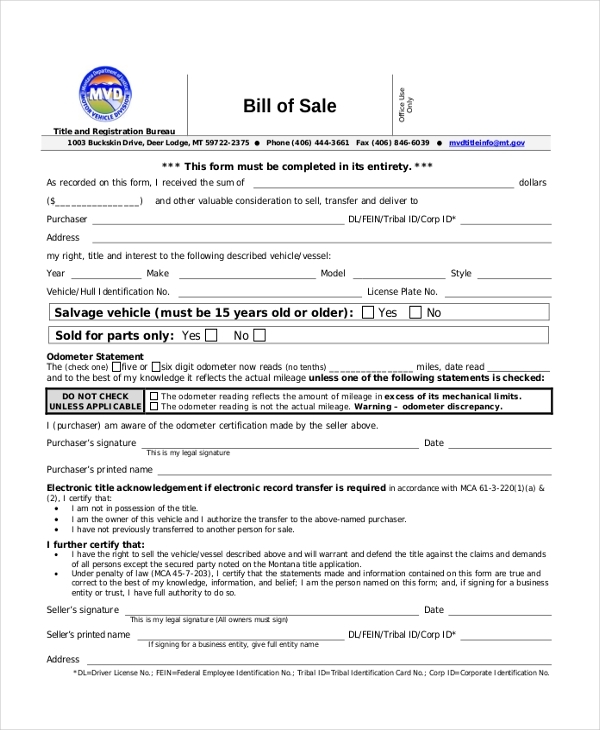 For a seller, this bill of sale is much more important because it proves that vehicle has been sold by you and you are no longer responsible for it. Whether the new owner indulges into traffic violation or any sort of accident, you will stay safe from various kinds of obligations in such circumstances. You may also see Sample Bill of Sale Forms. What are the Benefits of Vehicle Bill of Sale Forms? There are numerous advantages offered by a bill of sale vehicle a few of which are as follows. Bill of sale for cars or any other vehicle serves as a legal document for the sale that took place between two parties. It confirms the transfer of ownership of the vehicle and acts as an evidence of the contract. A bill of sale document can also help you in applying for a loan from financial institutions. This document also helps both buyers with easier and hassle-free registration of the vehicle. A bill of sale also helps to prevent any kind of disputes between both the parties in future about the rights of the vehicle. Are you finding the right kind of bill of sale format online? Then all the above-listed samples might be useful for you. Whether you need to create a bill of sale for cars, motorcycle, commercial vehicle or any other vehicle, you can utilize any of the above-listed bill of sale formats to create a legal document for recording the sale contract. You may also see Bill of Sale For Cars.